You are perhaps wondering whether or not you should play Ni no Kuni, the RPG by Level-5 and Studio Ghibli that comes out today on PlayStation 3. Let me put it simply: Yes. Ni no Kuni is a fantastic game. Although I haven't played enough to feel comfortable writing up a full review—I'm around 14 hours in so far, and taking my time—I think it's safe to say that yes, if you are a fan of role-playing games, or Studio Ghibli movies, or fun, this is an experience worth having. The first thing you'll notice about Ni no Kuni is just how gorgeous it is. That part's obvious. But what you might not notice right away is that the soundtrack, performed by the Tokyo Philharmonic Chorus, is just as powerful and welcoming as the Ghibli-crafted animation. Many Japanese RPGs come with great music, but Ni no Kuni comes with an actual score—instead of following a few catchy melodies, the horns and harps swell up and down as you walk through the world, meandering as if they're going on their own adventure with you. It feels like you're roaming through a movie. You play as Oliver, a little kid who goes through some serious tragedy and winds up traveling to a new world, where he has to become a wizard in order to defeat the evil Dark Djinn Shadar and yada yada yada. So he has to go off and find a bunch of Great Sages to get more powerful and really this is all well and good but it doesn't really matter all that much because the appeal of this game lies in the adventure, not the excuse you need to go on that adventure. So, yes, Oliver needs a reason to fight his way through deserts and forests and rumbling volcanos, but the sights and sounds justify themselves. Ni no Kuni's world is surreal and wonderful, well worth the trip. The voice-acting is phenomenal, good enough to make me think about reconsidering my opinion on English voice acting in Japanese RPGs. Mr. Drippy's Welsh drawl steals the show, but all of the performances are extremely well done. Children in video games are usually annoying. Oliver is not. He feels and sounds like a real human being, and even when you might get sick of his naivety, his blind, innocent courage is appealing in a "wow, I wish I could do that" sort of way. As always, Level-5 has done excellent work with the localization. Hope you like animal puns. You get your very own book filled with wizarding spells, interesting stories, and even a made-up language that actually asks you to pull out a pen and paper IRL so you can decipher Special Wizard Code. Lucky pre-orderers get a physical version of this book, but you can see all of it in-game. Part strategy guide, part Easter Egg-filled lore tome, it's the type of thing that can steal an hour or two of your time. 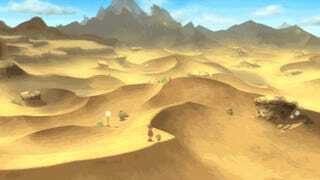 The attention to detail is awe-inspiring: Oliver's cape swirls and flows in the wind, enemies run away from you when you're bigger than them, towns are full of random little secrets and treasures. When you get large objects, your tiny companion Drippy will carry them over his head. One town you visit has enacted a law that everyone is required to wear a bathing suit at all times—so naturally, your characters swap into bathing suits every time they visit. Ni no Kuni is a lot like Dragon Quest VIII—a fantastic RPG, also by Level-5—in many ways, from silly animal puns to crafting cauldrons. In most ways it's even better. This is a traditional JRPG, yes, but it also feels smart, engrossing, and modern. One of the bosses is a genie that must have been inspired by Robin Williams's memorable performance in Aladdin. As you fight him, he'll pull out random objects from a giant cauldron: melons, parasols, ladies' undergarments. Whimsy! So yes, Ni no Kuni is very good at making you feel like you're on an adventure, a whimsical adventure filled with personality and charm. When I run down the mental checklist of everything I'd want in a JRPG: sharp writing, clever characters, addictive combat, a fulfilling world, and lots of interesting things to see and do, Ni no Kuni hits every mark. ...Which is good, because combat is tough, and you'll need to keep battling monsters in order to keep your party up to speed. There are a lot of tough bosses. The combat, by the way, is bloody brilliant, a blend of turn-based and real-time battle systems that feels fast-paced and intense. It's sort of a cross between Dragon Quest, Tales, and Pokemon. You collect creatures, level them up, and equip them. During combat, you can move around the battlefield in real time, dodge enemy attacks, and try to get into good position to use physical strikes or spells against your opponents. When you attack or defend, your character will be stuck in that action for five seconds or so. You can't move him around while he's attacking or defending. You can cancel mid-action, in case you want to run around to try to collect the randomly-spawning green and blue orbs that restore your health and mana. You'll want to do this fairly often, as when a boss uses a special attack, the only way to survive is sometimes to stop whatever you're doing and defend immediately. Optimal strategy will vary depending what sort of boss you're fighting. It can be really frustrating when you're casting a spell and an enemy catches you off guard just before you get a chance to defend, but the satisfaction of taking down grueling bosses is totally worth the risk. There's a cow queen, and everyone calls her "Your Moojesty." This is very important.